I just re-read the awesome post from my friends David Loftesness and Raffi Krikorian, What Does A VP of Engineering Do Again? And while I agree with everything that they say, I think there is one crucial item missing, which has been present in every job I’ve had because all of them were user-facing internet services and a majority of my job has been working with product teams. Collaboration with stakeholders (especially with product) is key, but if you take it one step further, a VP of Engineering is actually measured by execution in a wider context across many teams or departments. You cannot look at engineering in isolation for your successes or failures. But first a short story about my first months at SoundCloud. The CTO wanted more front-end work done because an important release was nearing. He asked me to hire more engineers to accomplish that goal. I started recruiting, but then I looked at why the velocity of the existing team was not meeting expectations. So, I went to all of the front-end teams (at that time it was Web, iPhone, and Android) and asked a very simple question “What slows you down the most in your day-to-day work?” To my surprise, everyone gave the same answer “We only have one designer.” They went on to say that although the designer was very good, she was completely overloaded so designs, changes, and simple clarifications took forever to get done. Now that I knew design was actually the cause for delays, the solution to my problem was not to hire more engineers (which might have even made the problem worse with more work for the designer), but to start building a design team. Engineering leads need to look at the whole product process (together with the responsible stakeholders) and not just at engineering in isolation. What I did was a very simple (but, in this case, effective) form of value stream mapping. Our self-improvement at SoundCloud continued. 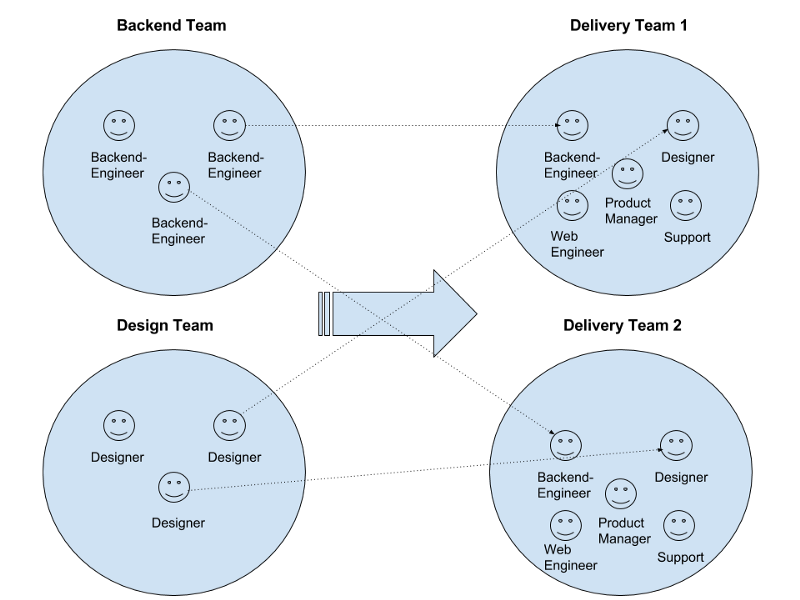 You can read Phil Calcado’s excellent post about the organizational aspects of microservices at SoundCloud. Continually assessing situations in a holistic way isn’t just the job of an engineering lead — everybody involved should take responsibility. But, in my experience, the problem usually surfaces in engineering because when things are not moving fast enough (and when do they ever?) management’s first reaction can be to throw more engineers at the problem so more work will get done, but also (and this is the not so nice scenario), management thinks the engineers are not working hard enough. Other common responses from management include reorganizing the teams or adopting new methodologies. However, as an engineering leader, you are a lot like a doctor: you need to diagnose the illness before treating the symptoms. Engineering leaders need to look at the whole value chain and to sit with the leaders from affected departments to review at the problem. The solution to a problem might not be to hire more people (which a lot of startups do), but to organize product development in a better way. And if you have to hire, it might mean that you have to move headcount around. When everyone has the same goal goal — delivering more business value — shifting headcount from engineering to design or to recruiting shouldn’t be an issue. Afterall, the goal is more business value, not having the biggest department. So, when I realized our problem at SoundCloud wasn’t going to be fixed by adding more engineers, we created a design team. But this was just the first step towards a better setup. Even after creating a larger design team, it remained isolated from other departments and was not fully integrated with our workflows. The problems of turnaround and wasted resources were exacerbated by the increasing risk of misalignment between product, design, and engineering. Therefore, the next logical step was to improve the organization by creating a delivery team per product. Creating these delivery teams and then making sure you have the right staffing for them should eliminate a staffing mismatch between the affected departments. Some team members (like support) might just be a pointperson for the team, e.g., the support person only attends the daily standup and reports what is going on. So, don’t look at engineering in isolation when trying to solve delivery problems. It is critical that each engineering leader (and especially the VP of Engineering, who can really influence the organizational setup) ensures that the overall product development process is set up in a way that reduces waste and delivers value to the customer which is the whole point of product development in the first place! This post includes material from the upcoming book “Scaling Teams” by myself and David Loftesness, which will be published by O’Reilly in 2016. In this book, we will explain in detail the various scaling challenges of software startups. It’s funny how things work out, what we see when we open our eyes and raise our curiosity. In particular, two events this week that in one moment filled me with dread, then filled me with hope and possibility. The low productivity of British workers has several possible culprits. Inefficient family-run companies are sometimes blamed, as are poor workforce skills. But whereas these problems are well documented, another factor is glossed over: the mediocre performance of British bosses. John van Reenen, director of the Centre for Economic Performance at the London School of Economics, argues that the standard of British management is “significantly below” that in leading countries. His team carried out 14,000 interviews with employees around the world and found that British workers rated their supervisors lower than those in countries such as America, Germany and Japan. “We are not in the premier league,” he says. Management as a skill has rarely been taken seriously in Britain, where the cult of the gifted amateur prevails. Ann Francke, the head of the Chartered Management Institute (CMI), says that four out of five bosses are “accidental managers”: they are good at their jobs but are then promoted into managing a team or a department, without further training. Unsurprisingly, “they flounder”, she says. Mr van Reenen reckons that about half the productivity gap between Britain and America could be attributed to poor management. Inefficient family run companies? Funny that, because on the very next day I found myself in need of the services of a family run company. My wife’s lovely Michael Kors watch had used up all of it’s battery charge and a replacement power cell was needed. The most obvious place to get this done is my local Timpsons. You may know of Timpsons. You may even be a customer of theirs – everything from key cutting, engraving, shoe repair to wrist watch maintenance. But do you know John Timpson’s approach to management? In a recent article in The Independent, Mr Timpson explained his philosophy. So what was my experience? As someone who is often frustrated by lack of customer service, I find the whole Timpson experience leaves me with a smile on my face. I took the opportunity today to ask the 2 guys serving, what is life really like as an employee? Why, I asked. “Because we are left alone to get on with it. This is our store. We get guidance, sure, but we make the decisions because we are with the customers every day”. And how does that make you feel? “Trusted!” was the immediate response. But does this upside down school of management work commercially? Well, Timpson recently reported sales up 12 per cent to £189m and profits 38 per cent higher at £18.7m. Furthermore, over the past three years the company has grown rapidly – from 800 stores to 1,400. Yet again, more evidence that shows having engaged staff not only results in a better, happier work place, it also brings commercial value. I write these articles as part of my own learning. Thank you for reading it.